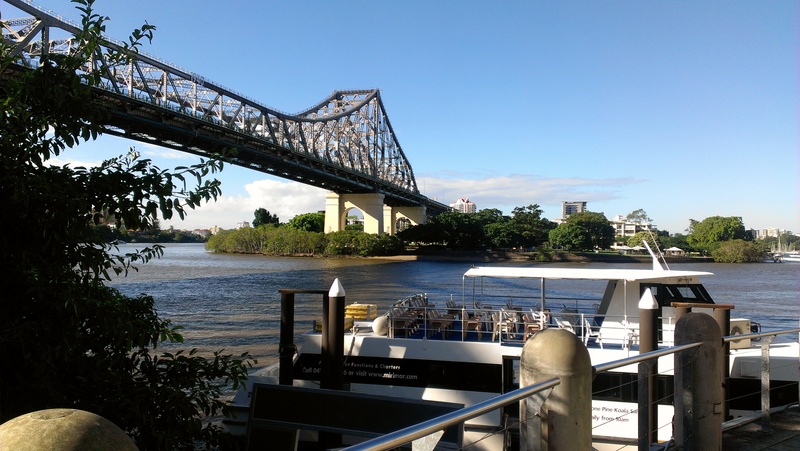 Suitability: Great walk for visitors to Brisbane with the route along the river taking in the Botanical gardens and the Story Bridge. Perfect for wheels with pathways all designed to be shared between pedestrians and cyclists. The walk starts the same place as Brisbane walk #1; at the top end of the Botanical gardens on the corner of Alice street and Edward street. Again, start by walking down the nice and shady pathway by the river and follow it as it goes around the corner and onto the Goodwill Bridge. Turn left at the other end and simply follow the pathway along the river towards Kangaroo Point. Some of it is on boardwalks and separated from the cycleway. Admire the views of the city across the river and enjoy the serenity of what feels like a quiet bushwalk right in the middle of the city. Look for the pelicans made of scrap metal! After you have passed the Riverlife Activity Centre and the boardwalk ends, turn right up Thornton street (there’s a sign saying Story Bridge 150m). The Story Bridge is the largest cantilever bridge in Australia and you can climb it by participating in an organised tour. Sadly it is also a notorious suicide spot. Walk over the bridge and you will reach the suburb of Fortitude Valley on the other side. Turn right and walk down the hill and you’ll see the entrance to the river pathway through a blue arch. Now you can walk along the riverfront on boardwalk all the way down to the Botanical Gardens. There are numerous restaurants and cafes along here so perfect for a well-deserved rest after your walk! 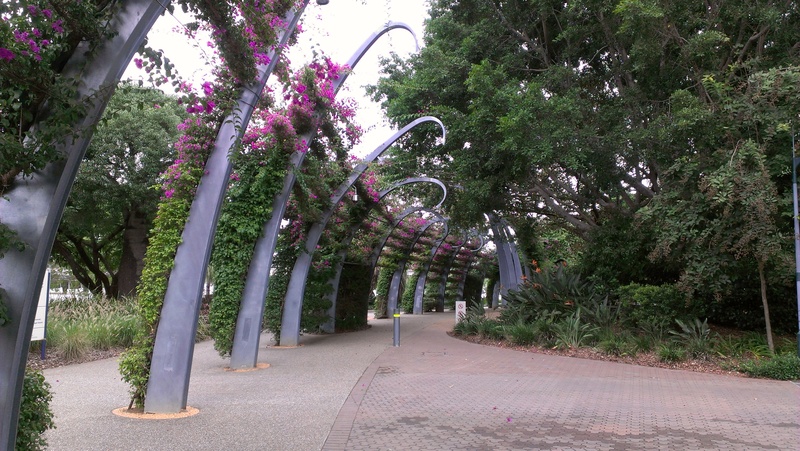 Suitability: Great walk for visitors to Brisbane with the route along the river taking in both the Botanical gardens and the South Bank entertainment precinct. Perfect for wheels with pathways all designed to be shared between pedestrians and cyclists. The walk starts at the top end of the Botanical gardens on the corner of Alice street and Edward street. Start by walking down the nice and shady pathway along the river and follow it as it goes around the corner and onto the Goodwill Bridge. This is a bridge for pedestrians and cyclists only but watch out for high speed cyclists! Turn right at the other end and then left when you get to the Smokehouse restaurant. Follow the pathway entering the South Bank precinct – this is a lovely are with parklands, cafes, playgrounds and even a beach! As soon as you see the archway covered in purple flowers (as in photo above) go up the steps and stay on this path. Brisbane is often hot and humid so shady and cool is a definite benefit, particularly when doing exercise. The path winds its way through the area including along the beach, and ends at the Brisbane Wheel (a visit on the wheel is a great way to get a nice view of the city). Turn right and walk down to the river and then along until you can get on top of the bridge. Walk across, admiring the views towards the city and the river is also a fairly busy thoroughfare with numerous ferries travelling across, up and down. On the other side you have reached Williams street and then walk diagonally across the park in front of the Treasury casino to get to George street. Turn right and walk down this street all the way to the Botanical gardens, there are some interesting historical buildings on the way. Go in the entrance by the Queensland Institute of Technology to the gardens and turn right. Stay on the path until just past the giant, fairy-tale like fig tree, turn left and then left again and walk diagonally up towards Alice street. Stay inside the park and turn right to get back to where you started. In both South Bank and the Botanical gardens there are numerous pathways and options so you can easily vary the walk by choosing different options through these areas.